They're covered in art by three female artists and filled with three litres of Victorian wine. Drinking sessions at home just got a whole lot more stylish thanks to the arrival of Pord — a new company combining art and wine in a rather gorgeous way. 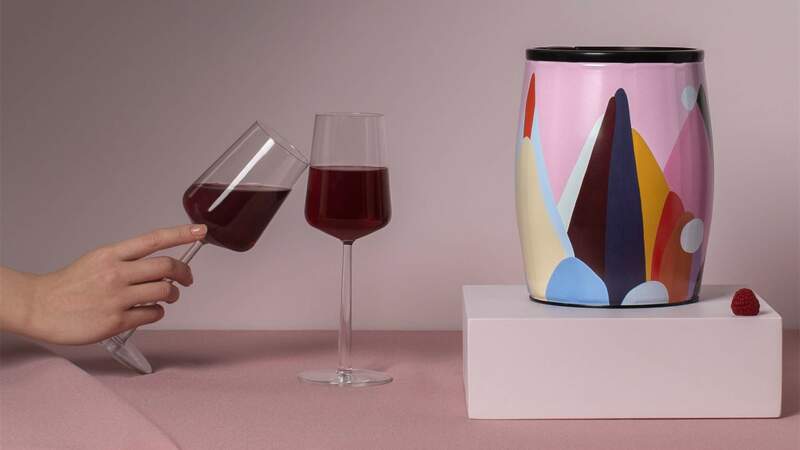 Pord has pooled the talents of three female Australian artists and Victorian winemakers Mitchelton to create its first series of mini wine barrel masterpieces, designed to bring more art and beauty into your everyday life. Each artist has contributed a limited-edition and eye-catching work to grace one of Pord's three-litre barrels, which each hold a neat four bottles' worth of wine. Illustrator Filippa Edghill's monochromatic artwork, titled Ancient Lines, is inspired by nature's curves; Melbourne artist Hannah Nowlan has contributed The Last Resort II from her most recent exhibition; and designer Evi O. 's work Sorbet is a vibrant painting with bold colours and pastels. Customers can select their favourite design and have it filled with one of three Mitchelton wines from the 2017 and 2018 vintages: pinot grigio, shiraz or rosé. Unlike regular bottles of wine, your beautiful barrel will keep wine fresh for four to six weeks after opening — and it can be repurposed. Hand-signed and numbered by the artist, and teamed with a certificate of authenticity, it's the kind of statement piece destined to be the talk of your dinner parties for years to come. And there are plenty more exciting artist collaborations in the works for future Pords. A pre-sale for Pord's covetable launch series kicks off at midnight on Saturday, July 14, with the goods to be delivered in October. The limited-edition barrels will set you back $160 each.